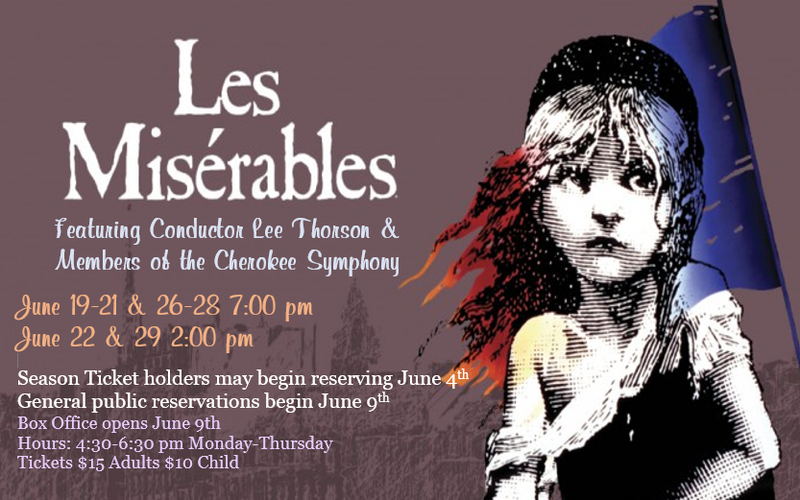 Opening night for the Cherokee Community Theater’s production of Les Miserables is just three weeks away, and over the next few weeks, I thought I would offer my thoughts on the characters and themes of this great story. However, before getting into all of that, I thought I might step back and share just why I am involved in Community Theater in the first place. Let me begin by saying how grateful I am to have a congregation and Session who support me in this endeavor. Over the past 8 years I have been in Cherokee, I have performed in 8 shows and helped with tech on a handful of others, and have never heard a complaint from my congregation. To be so involved requires a great balancing act between family, work, and the stage, but it has always been worth it to be part of such a great performance. One of the things I love about theater is the friendship and connections made in the community theater setting. Being a part of a show gets me outside of the church circle and into the community. Coming together as a community to put on a show, to tell a story, to share a message, gives us a common purpose and goal. I have made so many friends in the theater here, and have worked with some amazingly talented people. It is such an honor to be able to share the stage with them. I also love the theater, especially the musical, because it has always been a part of my life. My father was a classical violinist, directed the church choir, and was often involved in musical theater. One of my first memories was sitting in my dad’s conductor’s chair when he was directing “Two By Two.” Throughout high school and college, with every musical performance, my dad would be there, playing in the pit. I’ve performed in almost 20 musicals, and my father was a part of nearly all of them. Even today, community theater is a family affair. In this summer production of Les Miserables, I will be playing Jean Valjean, three of my children are in the chorus, and my wife is running the lights and sound. That being said, there are those who argue that Christians should not participate or even attend the theater. Sadly, very often, God is not honored on the stage. For the actor, theater, by its nature, can easily feed sinful pride and vain-glory. Standing in the lights hearing the applause can quickly go to your head. And yet, I believe theater can bring glory to God through a very powerful medium of storytelling. The stage allows an actor to step outside of himself and tell the story of sorrow and joy , brokenness and redemption… Every human experience, emotion, longing. Theatre can open you to the human experience in a way that no other art form can. It challenges the actors and the audience to confront issues and opens a forum for discussion. Theatre helps an audience ask “what if?” and leads them to think about how to live before the face of God. Plays are stories incarnate. They put flesh on our ideas, our values, our struggles. They can teach us to rejoice, that can lead us to repent. And, by God’s grace, they can help us become better human beings. We use story to communicate a higher truth, and in that truth, God may be glorified. Not every show, of course, but some, some of the best, even those that never mention God, cannot help but point us to God. The story of the Gospel is a divine drama, God incarnate, the Word made flesh, to save a broken, fallen people through sacrifice and love. I take part in theater to communicate good stories, because in these stories I can help communicate truth. While I may joke about being a diva, I really don’t need the spotlight, I don’t long for the applause, nor do I need the affirmation of men. I love being part of a cast and crew who, by using their talents and abilities given by God, can tell great stories and in doing so, share a glimpse of His great story. This entry was posted in Faith and Practice and tagged Cherokee Community Theatre, idolatry, Incarnation, Les Miserables, theater. Bookmark the permalink.